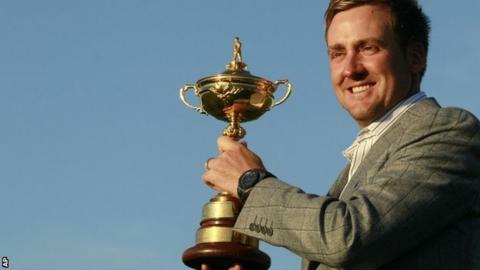 Ian Poulter believes the pressure of representing Europe against the United States in the Ryder Cup far outweighs that of playing in a major. The Englishman will play in the event for the fourth time when the sides meet at Medinah in Illinois next weekend. He told BBC Radio 5 live: "[You are] 1,000 times more nervous in the Ryder Cup than you would ever be in a major. "To be there in a major you want to do it for yourself but you want to do it for so many more reasons in Ryder Cup." The 36-year-old made his debut in the biennial clash in 2004 and was named as a captain's pick by Jose Maria Olazabal after failing to qualify automatically. He has a terrific record in the competition, having collected eight points out of a possible 11 and is unbeaten in the singles. He added: "There's no comparison between the pressure and nerves and excitement that you get in the Ryder Cup compared to any situation you play individually. It just means that much. "You've got 11 other guys, captains and vice-captains; you've got Europe all watching you and wanting you to do well. That just adds a lot of extra pressure." "Poulter seems to gain strength, rather than wilt, in this pressure cooker "
However, Poulter believes having Olazabal as team captain will be hugely beneficial for the team. "Olly is going to be an incredible captain, someone who is inspirational," he stated. "He said the right things at the right time as a vice-captain [in 2008 and 2010] and he's going to do an incredible job and say the right thing at the right time this time around. "Jose has such an incredible Ryder Cup record with [fellow Spaniard] Seve [Ballesteros] and obviously Seve's not going to be there so it's going to be an emotional rollercoaster for him, but I think the players will rally up and do the best they can."